America is facing a caregiver crisis, and one organization is helping come up with the solutions. The New York-based non-profit Paraprofessional Healthcare Institute (PHI) is working to improve the lives of people who need home or residential care by improving the lives of the workers who provide that care. Americans are living longer than ever before. By 2050, the population of adults over the age of 65 is expected to almost double, growing from 47.8 million to 88 million. 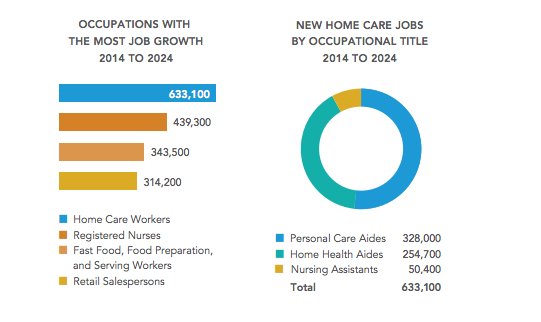 By 2024, home care occupations are projected to add more jobs than any other single occupation and is among the top 10 fastest-growing occupations. Which is why developing a quality home health care workforce is so important. But that has been difficult due to do the lack of investment in home care workers. In addition to advocating for increased wages, PHI is also implementing advanced technology into their training programs to increase the skills of their trainees, helping prepare them for a 21st century labor market, while giving them a strong sense of pride and confidence in their work and personal lives. One of the innovative training programs PHI piloted in 2015, with funding from the New York State Department of Health, was the Care Connections Project (CCP). To become a Senior Aide, trainees go through a three-month long training program, including six weeks of classroom training and seven weeks of on-the-job training at ICS. During that time, aides enhance their observation and documentation skills, learn how to effectively offer other home care workers support and education, and deepen their knowledge of the chronic diseases that are most likely to lead to the preventable re-hospitalization of ICS members. The sense of support and value aides feel in these new roles has resulted in increased confidence to be more ambitious and pursue further professional growth. Senior Aides see a 60% wage increase, amounting to about $11,000 more per year than the average health care worker. “It’s about creating rungs in the ladder, and developing the skills to climb that ladder,” says Angelina Drake, PHI Chief of Staff. Marisol Rivera (R) with client Althea Nelson (L). Marisol Rivera wanted to be a health care provider because she enjoys helping people who need help. She trained for 200 hours to become a Senior Aide and now teaches fellow health care workers how to use the telehealth tablet. The tablet was designed to allow the caregiver to observe, record and report any changes to the client’s condition which alerts a nurse who can help with treatment immediately and possibly prevent hospitalization. In her new role, Marisol says she feels appreciated and respected her peers, her supervisor, and the nurses she reports to. She says her children are very proud of her, especially her youngest. Maribel Espinell-Quintero, Marisol’s clinical manager, says she’s seen a shift in how Marisol feels about the work she does since she started the program. She says Marisol’s become more outspoken, understands her role and how valuable it is. In February 2017, PHI began identifying the most pressing policy issues facing direct care workers with the launch #60CaregiverIssues, a national, online public education campaign to tackle the growing crisis in paid caregiving. Facts and Trends. What does the latest research say about occupational trends, and the staggering mismatch between supply and demand? Future of Long‐Term Care. In many states, long-term care is being delivered through managed care organizations. What should we know about the how this impacts quality of jobs and quality of care? Quality Jobs. How do direct care worker wages compare to other occupations? What factors, beyond wages and benefits, impact the ability of employers to attract and keep these workers? Stories from the Field. Nearly 5 million direct care workers currently support over 8 million older Americans and people living with disabilities. Who are these workers, and who are the people they support? What can we learn from these stories about improving our systems of care? Training and Advanced Roles. Are a few weeks of training for direct care workers sufficient to meet the needs of millions of consumers living with physical disabilities or with conditions such as dementia? Posted on 23 Jun 2017 25 Jun 2017 by Jonah A. SteinhausPosted in Advocacy, Caregivers, GerontologyTagged Advocacy, Caregivers, Centers for Disease Control and Prevention, Health care, Health professional.